Akrapovič Evolution exhaust systems are designed for riders who demand maximum performance from their motorcycle. Systems are significantly lighter if compared to stock exhaust system and feature exceptional production quality, hi-tech materials and increased engine performance combined with pure racing sound output. Titanium Evolution systems feauture carbon fibre end cap. Product meets the USAD Forest service Standard for spark arresters FS5100-1. FOR CLOSED COURSE COMPETITION USE ONLY. NOT INTENDED FOR STREET USE. 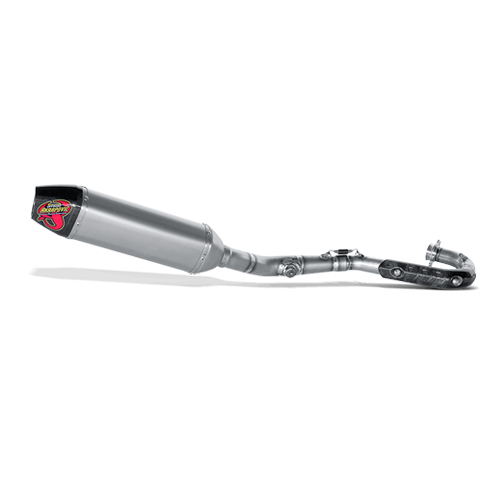 Like the Akrapovic dual muffler EVOLUTION version, the single muffler system is designed for riders who know who to take full advantage of the specific performance benefits offered by these systems. We should especially mention the new Akrapovic HEXAGONAL design muffler, which with its carbon-fiber outlet cap goes exceptionally well with the design of the Honda. 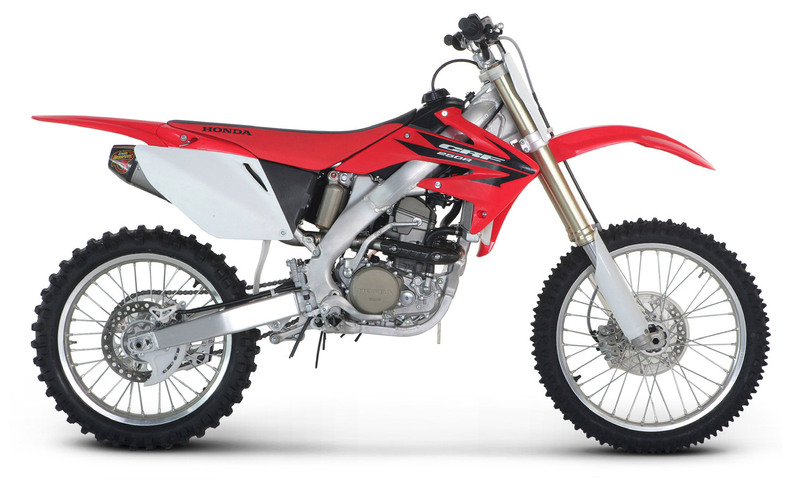 The muffler has a noise damper for the EU and other non-American markets, and a mandatory spark arrester for the American market. 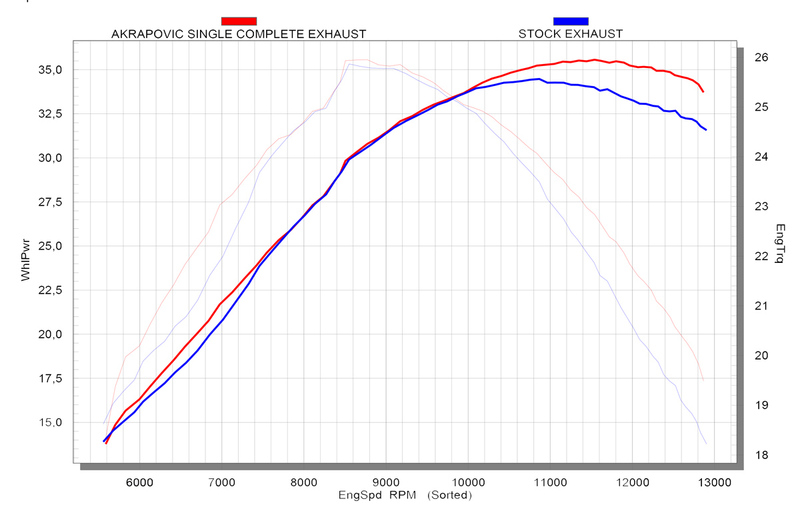 Power & Torque: the single muffler version delivers a perfomance increase mainly in the middle of the rpm range and at the top end and overrev. Good riders will know how to make the most of the advantage. The Akrapovic Evolution system uses titanium tubing. The tubes for the header assembly are flared to provide improved exhaust gas flow, while the link pipe is conical. The systems’ individual components - header tube and link pipe - are attached using a sleeve joint held together with a silicon-shielded spring. The link pipe is welded to the muffler. This system, unlike the stock system, has just a single muffler. It features a HEXAGONAL design muffler, which goes exceptionally well with the design of the Honda. The muffler has a titanium inlet cap and perforated inner sleeve. The outlet cap is made of carbon-fiber. The outer sleeve is made of titanium. 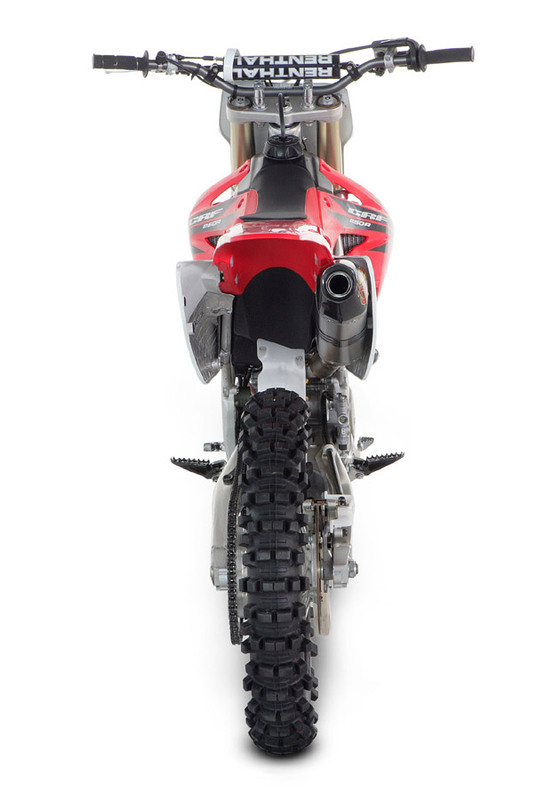 The muffler is attached to the frame using an Akrapovic offroad carbon-fiber clamp. Evolution system also includes a carbon-fiber heat shield. The muffler has a noise damper for the EU and other non-American markets, and a mandatory spark arrester for the American market. 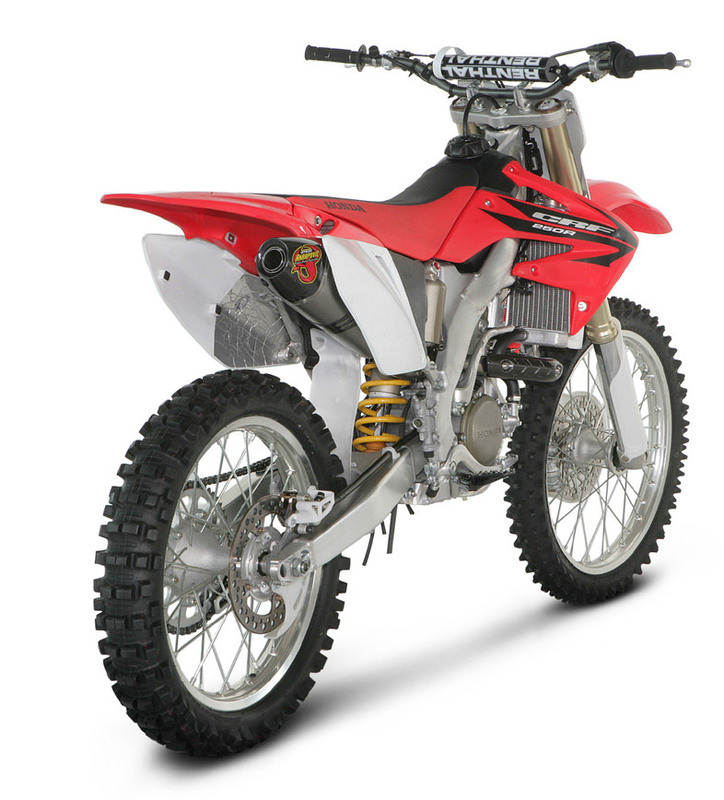 ** Technical specifications of Akrapovic exhaust systems and related products subject to change without notice.